Shefford Town & Campton leapt back to the top of the Bedfordshire League on Saturday - without kicking a ball themselves. They were awarded three points when scheduled opponents Kempston Rovers Development failed to raise a side to meet them at Hillgrounds. Former Premier Division supported by Sportsform leaders Caldecote were forced to sit the afternoon out after their game at Renhold United was called off due to a waterlogged pitch and they slip to fourth. Now in second spot are last season’s champions Flitwick Town who notched up their fourth away win on the bounce with a 4-1 victory at AFC Oakley M&DH. Phil Matthews with a brace plus strikes from Michael Keep and Chris Howells did the damage, Alex Liburd replied for Oakley. Stevington stay third despite being held to a 2-2 home draw by Sharnbrook. The visitors went ahead via Tony Boamah but home strikes from Martin Danobrega and Billy Roberts looked likely to secure Stevington the points that would have lifted them into second – until the visitors’ Hayden Jones netted in the 90th minute. The remaining three scheduled games – Crawley Green Reserves v Wilstead, Ickwell & Old Warden v Wootton Blue Cross and Marston Shelton Rovers v Cranfield – all fell to waterlogged pitches. Totternhoe Reserves are now four points clear in Division One supported by O’Neills after they maintained their 100% home record and took their unbeaten sequence to 13 games with a 3-1 victory over AFC Kempston Town & Bedford College Reserves. Joe Smith netted twice and Oliver Hibbett once against a lone Town reply from Elliot West. With Wixams not in action second place now belongs to Riseley Sports who made it 10 unbeaten by winning 6-0 at bottom of the table The 61 FC Luton Reserves. Jack Healy with a brace was joined on the Sports scoresheet by Mitchell Crooke, James Cooke, Aaron Keech and Jay Willett. Perhaps the shock of the day saw Shefford Town & Campton Reserves return to winning ways for the first time in seven outings with a 6-3 home victory over a Flitwick Town Reserves side who were losing for the first time in seven gamess. Simon Castle led the way with a hat-trick, Cameron Sharpe netted twice and Sam King once. The visitors’ replies came from Mark Bartlett (2) and Jim Lewis, and they had goalkeeper Peter Hyde to thank for keeping them in the game early on when saving a penalty just 10 minutes into the game. Sandy won 4-0 at home to second from bottom side Meltis Albion with goals from Daniel Whitten, Max O’Keefe, Phil Beall and Charlie Richardson. Cople & Bedford SA v Biggleswade FC Reserves and Cranfield United Reserves v Henlow were postponed. Bedford Albion are new leaders in Division Two after securing a 7-1 victory over Wixams Wanderers, a result that stretched their unbeaten home run to six games. Adam Lewis with a brace was joined on the Albion scoresheet by an own goal plus strikes from Paul Babbington, Adam Wodecki, Ashley McDonald and Ryan Kelly. Oilver Benham scored the lone reply. Albion took over the top spot from Henlow who were surprisingly beaten 4-3 at Marston Shelton Rovers Reserves. George Rogers, Gary Russon, Jake Cullum and Lorenzo Jordan were the Rovers marksmen, with Russell Ayles, Luke Hills and Piers Le Grand scoring for Henlow. 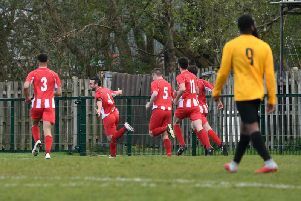 There was also a 4-3 home win for Westoning over Sundon Park Rovers. Lewis Wilson with a brace plus Lewis Cooksley and Tayler Clayton netted the goals against Rovers replies via Tirell Jeffers twice and Carl Williams once. Caldecote Reserves were 7-1 home winners over Atletico Europa. Josh Wilson and Dan Fennell both netted braces and were joined on the home scoresheet by Nicky Albone, Martin Chappell and Jack Stagg against a lone reply via Jamie Southwood. In Division Three, For Flitwick Town A it was a return to winning ways for the first time in seven outings with a 5-0 home victory over Dinamo Flitwick. Dom Collins, Luke Snapes, Dan Howarth, Jack Garnish and Jamie Smith netted the goals to bring up the nap hand. AFC Kempston Town & Bedford College A saw their four game winning run ended when beaten 3-0 at home by Black Swan. Ben Smith scored twice and Danny McGovern once.